Best warranty in the industry. Relax. we have you covered. Elegant shutters are backed by a "Consumer Assurance Guarantee". 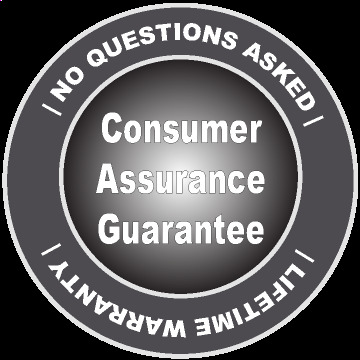 Our "Consumer Assurance Guarantee" will cover your shutters, to the original purchaser, for two instances, per order, of damage for any reason. (Finish is covered for the life of the product but colorfastness is only covered for three years) After the two repairs have been performed, don't worry, your shutters are still covered under our transferable Limited Lifetime Warranty. Our Limited Lifetime Warranty covers your shutters against original defects in materials or workmanship. The "Consumer Assurance Guarantee" and Limited Lifetime Warranty are both activated upon the products being properly installed and accepted by the consumer. Repair and replacement will be at the sole discretion of elegant shutters. Please contact the original dealer for warranty assistance. Visit elegantshutters.com/Contact Us to request product manuals and technical support. Repair or remake of defective products is the sole remedy under this warranty. Repairs will be made with like or similar parts. This warranty does not include shipping charges or labor. Warranty claims must be accompanied by proof of purchase, as well as details regarding the nature of the problem, location of the product, etc. This warranty is exclusive and in lieu of all other obligations, liabilities or warranties. All other warranties, both expressed and implied, are explicitly disclaimed. In no event shall Elegant Window or Elegant distributors/dealers be liable or responsible for incidental or consequential damages, or for any other direct or indirect damage, loss, cost, expense or fee. Products are not covered on damage that occurs during instances of Natural Disasters or "Acts of God". Some states do not allow the exclusion or limitation of implied warranties, or incidental or consequential damages, so the above limitation may not apply to your state.